Torch This Place is the first major label album and last ever release by The Atomic Fireballs. Finding initial success on the Vans Warped Tour in 1998, the band released Torch This Place the following year but unfortunately they never followed it up and subsequently faded into obscurity before they could make a name for themselves, much like the short lived swing revival scene. 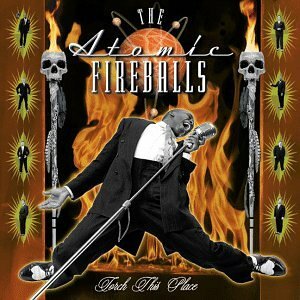 While best described as a swing revival act, The Atomic Fireballs effortlessly match the powerhouse performance style of bands associated with the punk scene, which is something that cannot be said for most swing revival acts. This, along with John Buckley’s distinct throaty singing voice, makes The Atomic Fireballs stand apart from their contemporaries. Their sound is not centred on a single instrument and instead opts for letting them interplay with each other to create a layered and rich listening experience that is easiest to recognise on Mata Hari and Flowers in the Sand. The brass section consists of a trumpet, trombone and a tenor saxophone that steals the show more often than not. Drummer Geoff Kinde provides a good number of short and sharp fills between his powerful and rhythmic percussive thumps. The double bass and piano make louder contributions the quieter numbers Lover Lies, Hit By a Brick and Starve a Fever but can still be heard well enough on most of the other songs. The guitar on the other hand is by far the quietest instrument on the album and it is hard to hear it outside of Mata Hari and Spanish Fly. The Atomic Fireballs are often over looked due to their short career but their ability to write swing jazz songs with punk-like energy makes Torch This Place a unique and electrifying album that is definitely worth your attention.